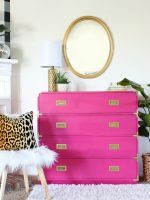 I recently redid my master bedroom and the biggest thing I did was paint the furniture and add in a new little dresser. 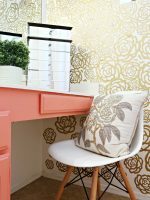 Before I show you the whole room reveal I wanted to go through and give you all the steps for painting the furniture that way you can paint some of your own stuff . So First thing was first, Picking out the paint and products needed, I choose to use swiss coffee by Behr. Paint makes all the difference! I was dragging my feet about paint my furniture for the longest time and now I wonder why in the world it took me so long. If you have a piece you are going back and forth about painting, Paint it! 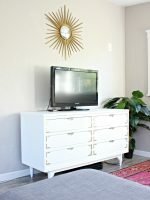 My bedroom furniture was not cheap and I thought I would regret painting it but honestly it was the best decsion ever! It really lightened up my room. Almost everything I need to do this project was from Home Depot. To start I wiped the furniture down with a wet wipe and then I wiped out all the drawers. Then I used my sander with a fine grit (like 150 grit) sand paper to go over the whole piece so that the primer would adhere really good. I used my all time favorite sprayer which is from Harbor Freight and only cost $30 but is normally on sale for $17. Now, this sprayer is not a sprayer that I use for years and years. 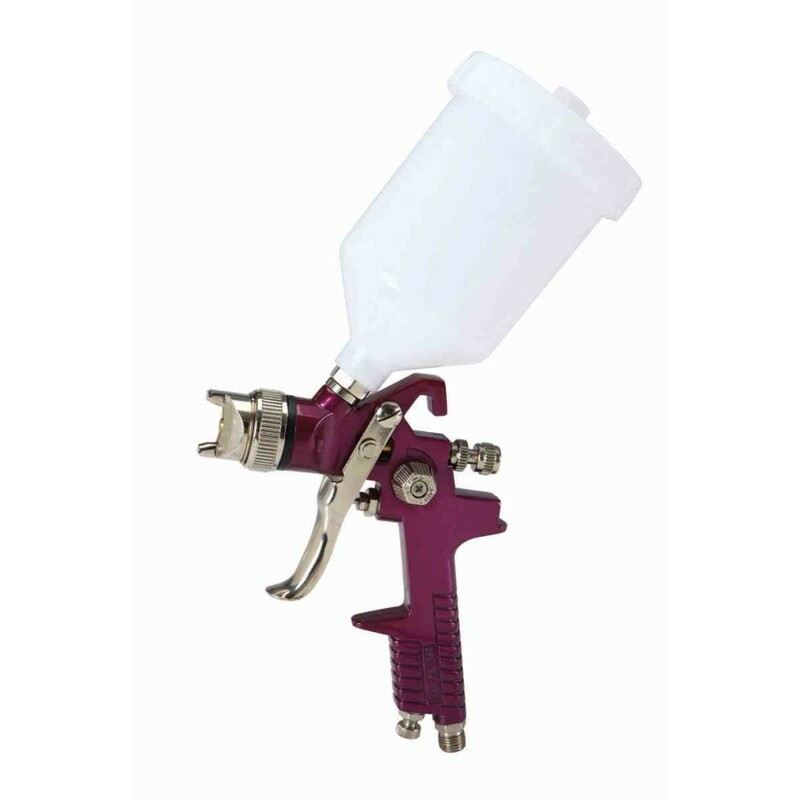 I normally will pick up two sprayers and after 7 or 8 different projects I use a new sprayer. I know there are different sprayers that last a lifetime but I have loved this one and I am use to it. And you can’t beat $17. I was able to paint all the furniture in one day. I started out with spraying all the furniture with Kilz 2 Latex Primer in a gallon and luckily it went through my sprayer totally fine. Then I gave the furniture two coats of the swiss coffee. That color is the perfect creamy white in my opinion. I love it. My hardware did not come off on the nightstand and so I had to spray a little bit of spray paint onto a paint brush and then just brush it on. On the dresser in the front I took off all of the hardware and sprayed it with our favorite gold spray paint. 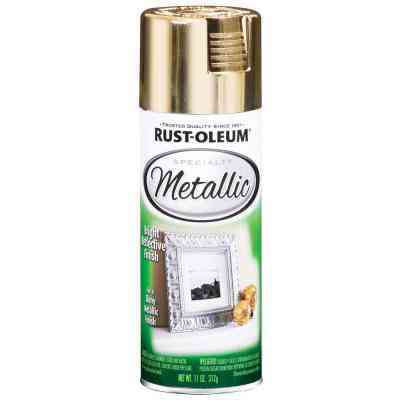 Mal and I both love this gold spray paint. Its a great color. I am loving my new bedroom and I cant wait to show you the rest! 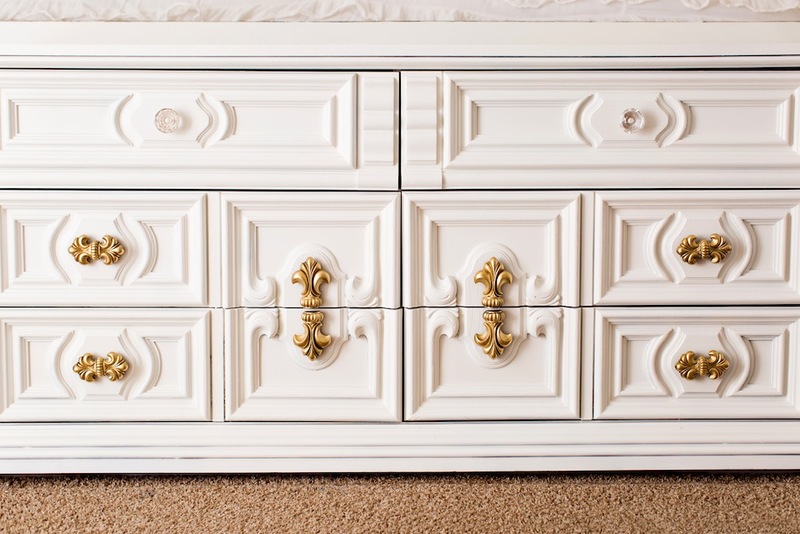 DON’T be afraid to paint a piece a furniture.Maybe, don’t start with a family heirloom, but pick up something cheap from a thrift store first. The more you paint the better you will be. Don’t over think it. 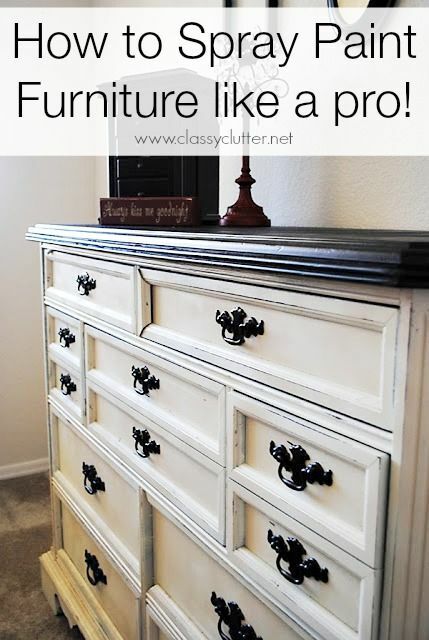 When I first started to paint furniture I was over thinking every single thing.You can do it! And you can always repaint something! 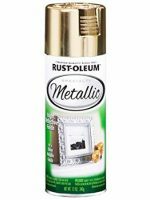 I like to use semi-gloss or satin finish for my paint. 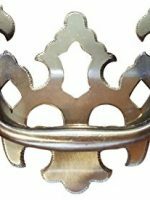 On high traffic pieces always to a clear coat or poly coat or wax. If you find these tips useful then please share it! PIN IT! I’ve just started painting furniture and I’m a bit frustrated to be honest. Everything I’ve painted so far remains sticky and tacky even after days of letting it dry. I’ve been using a latex paint and I’ve read that this could be my problem. 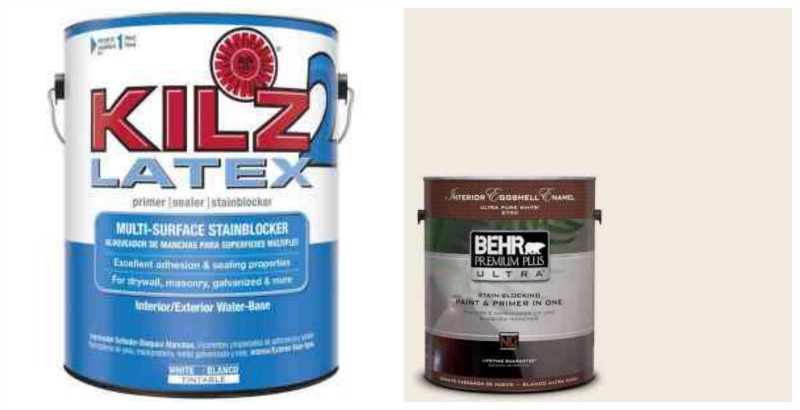 Which type of paint do you use and how long do you let it dry between coats? 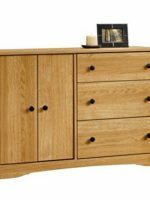 We usually use water based latex paint, chalk paint or spray paint on all of our furniture. Oil based takes FOREVER (like overnight in between coats, forever!) to dry! For water based latex, we usually wait an hour or two in between coats. If you paint the next coat too soon it will take up to two weeks for it to feel like it is fully cured and let’s be honest, no one has time for that! Good luck and be sure to let us know if you have questions! Williams Pro-Classic (Acrylic bassed) and Ben Moore Advance. You know how latex paint always stays tacky?? Well the acrylic doesn’t. These paints were formulated for trim (which are wood). 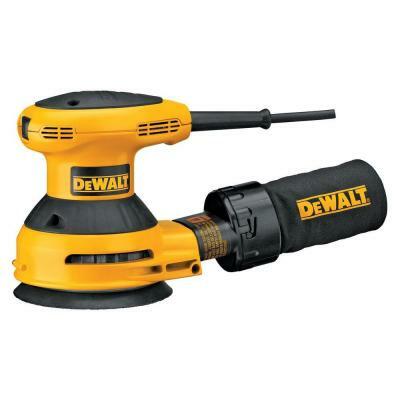 Try the SW top of the line pro classic or the Advance. Trust me. You won’t use the Behr again. 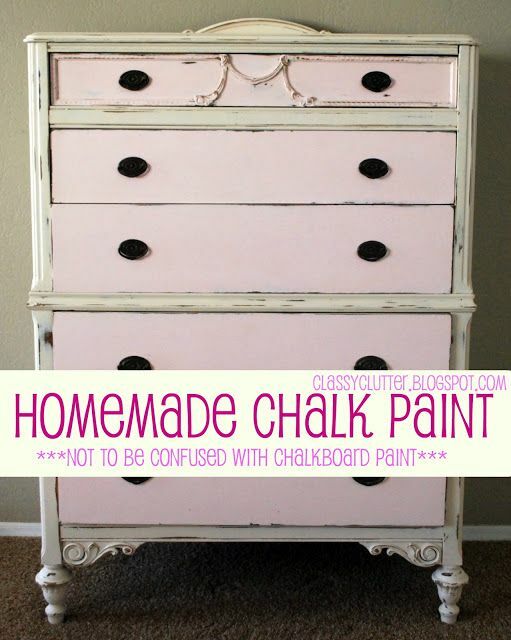 Although the Behr for homemade chalk paint is, hands down, the best to use! 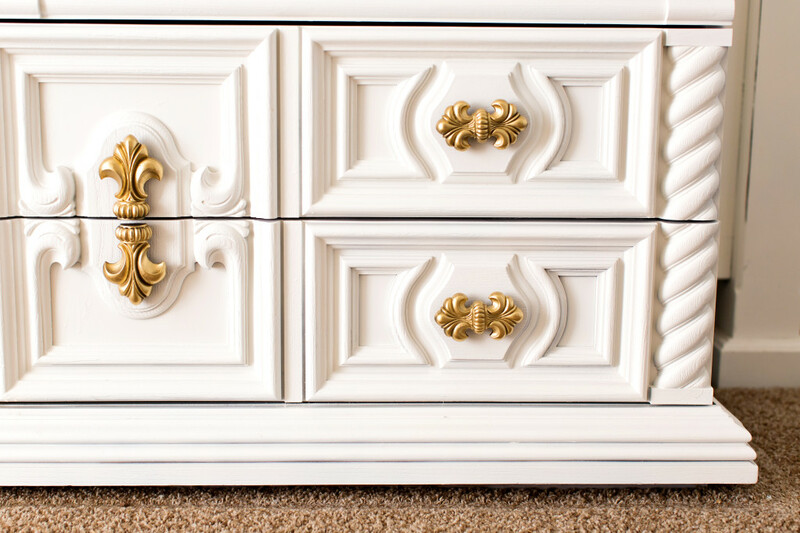 Looking at your beautiful dresser make me want to paint some pieces of furniture right now. Thanks for inspiring me. I’ve also been going back & forth with painting my furniture too .. for about 12 years! Every time I’ve come close to it, I’ve had yet another friend tell me it’s sacrilege …. mainly because it’s all beautifully made & solid ask, rosewood & oak … However, I finally started painting smaller items first … & am so thrilled with it! I can’t wait to start on the large pieces now. 🙂 I’m using a semi-gloss water based enamel based paint .. Taubmans (I live in Oz so not sure if it’s a US brand) … It’s the first time I’ve done any painting & initially I thought that it left a flat finish & brush strokes … but after it had dried overnight … wow … what a difference! 🙂 It’s exactly the finish I wanted! No brush strokes … & I had a plain white tinted so that although it still looks white, it’s not a ‘jump out & bite you’ white ..! It’s great to practice on smaller items that don’t matter if there are mistakes, but fortunately they still came out perfectly! I found that it was a good idea to set the pieces on a ‘lazy Susan’ ..(plates with ball bearings underneath so that they are like a turn-table) as they are easy to turn around without touching the piece I’m painting. I also found that it was well worth giving a light sanding to parts where I’d ended up with not quite perfect painting … like runs/drips, etc. I also added just a tiny amount of water after the first coat on the few items I painted. The paint seemed just a tad thick when I brushed it on .. but the water made it just perfect! However that could have been due to the very warm weather … 32C (approx. 94F) .. & a slight breeze … I’m now kicking myself for not having taken the plunge years ago! I intend to paint inside the drawers & cupboards with a very, very pale lilac … & when I say Very pale, I mean only a hint of it … However I am still uncertain about painting the whole of each piece, so intend to leave the tops the natural timber as it’s an easy fix to paint the tops if I still want to rather than removing it once it’s deep into the grain. I just thought that the contrast might give it all a slight ‘grounding’ … but I’ll make the decision after I’ve painted each of the pieces … & even then, maybe I’ll live with them for a couple of weeks before deciding. I also have a book-case with glass doors that will also get a coat of white inside, perhaps with a spray/roller lace effect finish using lace as a ‘stencil’ … 🙂 Might even try using silver spray paint for that too. I’m getting so very excited now that I’ve finally started the painting as it’s the impetus that I needed … I’d been putting off doing anything because I knew that I wanted to paint the furniture first. Susprizing ! You can complete all the furniture in one day . The last month , I painted my cabinet but after 2 days, it was completed. I love your black cabinet , it is so nice . Great! White and gold is a great combination. I love these style. Thank for share this awesome post.